Tired of waiting for your eBay goods to land on your front porch? You might not have to wait much longer. 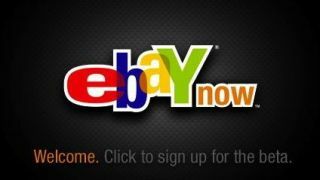 eBay is currently beta testing a new same-day delivery service dubbed eBay Now in the San Francisco area. Available as an invite-only iOS app, eBay Now offers $5 same-day shipping on purchases of more than $25 from retail partners such as Target, Best Buy, Nordstrom, Toys R Us and Macy's. According to Lina Shustarovich, an eBay spokeswoman, the service allows users to order a product from a regional store and "experience the convenience of same-day delivery, from phone to door in less than an hour." The hour-long delivery time is available as long as purchases are made within 30 minutes of a store closing. Those lucky enough to have gained beta access will receive $15 off their first order, plus free shipping on their next three orders. The San Francisco pilot program is currently running seven days a week. Rumors of Amazon attempting to launch their own same-day shipping service have been making the rounds, as both Forbes and Slate indicated the online retail giant is planning to build more local distribution centers in major cities. Amazon already offers $3.99 next-day shipping in addition to free two-day shipping to all of its Amazon Prime subscribers. While Prime costs $79 a year, eBay Now's beta program is completely free, save for the costs of the items and a $5 shipping fee. Another key difference is that Amazon's potential service would still use the company's vast, multi-national resources, while eBay Now has partnered with local retailers to provide products to consumers. When asked by TechRadar about the potential expansion of eBay Now beyond San Francisco, Shustarovich said eBay will "gauge user interest, inform product enhancements, and evaluate the future of this innovative local shopping experience." You can sign up for the beta, and get a heads-up when eBay Now maybe coming to your area, right here.